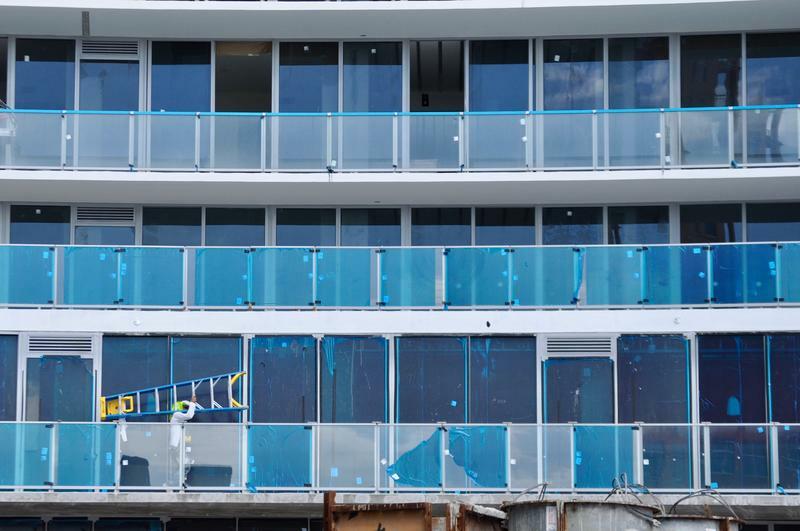 A subcontractor at work on the windows of the Auberge Beach Residences in Fort Lauderdale. About 25,000 fewer people work in South Florida construction now compared to a decade ago despite the rebound. Construction cranes may dot the South Florida skyline. Construction zones may occupy our streets. Cement trucks and tractor trailers carrying bulldozers may mingle in our traffic. But there are fewer people working in construction in South Florida than there were a decade ago when the real estate boom came crashing down. This building boom doesn’t have unbridled activity like the last one, and it doesn’t have the workforce either. Sixteen percent fewer people are working in construction today compared to the beginning of 2006, even though pay has jumped 15 percent. Patricia Bonilla started her company in a garage. She was a single mom with three kids and she says she prayed for years to have her own company. She led the construction division of the city of Fort Lauderdale. She went out on her own in 2007 just as the real estate market was collapsing. 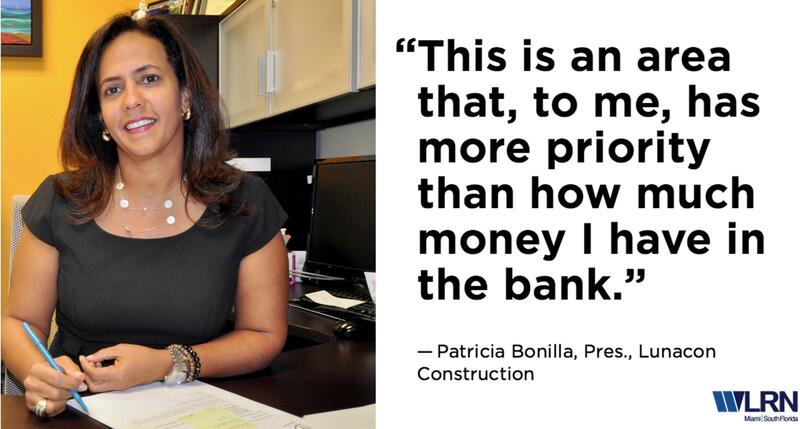 Ten years later, she expects her company, Lunacon Construction Group, to have $17 million worth of business this year. Her goal is to hit $100 million in sales in a decade. But she knows growth will depend on finding and keeping the right employees -- from construction managers to carpenters. So she's refocused on employee relations and retention in an effort to compete for workers. Suffolk Construction is a big player in the building industry. Forbes estimates it does around $3 billion in sales a year building projects from Boston to Miami to San Diego. Senior Vice President Rick Kolb says the construction market is not sustaining the pay increases skilled labor has experienced. "When you hit that breaking point of labor availability not being there," he says, "[construction] prices tend to go up a lot." The high-end residential building activity has slowed down in South Florida, which Kolb thinks will help bring costs down, for a time. "Whatever they are, I'm sure they will be minimal in time before it starts to go again and there's a scramble to get labor." Russell Nash is the second generation to head up his family’s mechanical engineering firm William R. Nash. When it opened in the mid-1960s, the firm focused on plumbing. It now installs all kinds of mechanical systems for hospitals, hotels and airports throughout the southeastern U-S and Caribbean. The company has more than 300 employees and Nash says his skilled labor is getting older. Thirty years ago the average age of his experienced plumbers, heating-air conditioning technicians or welders would have been about 35, he says. Now, the average is pushing 50. He says the lack of younger apprentices threatens future growth for him,and the region. Bob Moss may arrive at a busy and noisy construction site in a spotless Italian sports car, but in its trunk is a pair of dusty, steady work boots. Moss has been in the construction business for about half a century, building buildings across North America. For most of those years he has been based in Broward County. He is chairman and CEO of the construction management company that bears his name -- Moss and Associates. He started it in 2004 and today it is a $1 billion firm with offices in four states and work across the continent. He says Miami-Dade County has the most pronounced imbalance between demand and supply of construction workers, but Broward County "is not far behind because a lot of guys work in the same market." 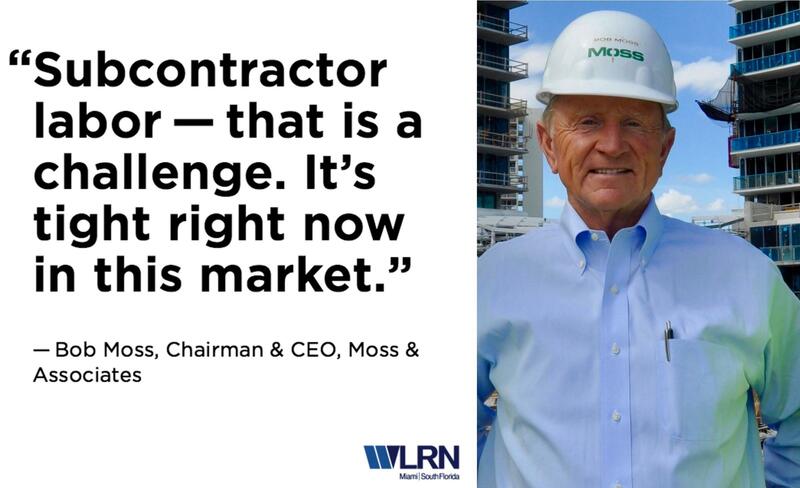 As Moss looks at his own business outlook, he expects the demand to remain, "The specialty trades are having to pay more to get the quality guys."